CHICAGO – In our latest comedy edition of HollywoodChicago.com Hookup: Film, we have 50 admit-two passes up for grabs to the advance Chicago screening of the new film “Terri” starring John C. Reilly from the producers of “Blue Valentine” and “Half Nelson”! “Terri” also stars Jacob Wysocki, Bridger Zadina, Creed Bratton, Olivia Crocicchia, Tim Heidecker, Justin Prentice, Mary Anne McGarry, Curtiss Frisle, Tara Karsian, Diane Salinger and Jenna Gavigan from co-writer and director Azazel Jacobs and co-writer Patrick Dewitt. The film opens in Chicago on July 22, 2011. To win your free pass to the advance Chicago screening of “Terri” courtesy of HollywoodChicago.com, just answer our question below. That’s it! This screening is on Monday, July 11, 2011 at 7:30 p.m. in Chicago. Directions to enter this Hookup and win can be found beneath the graphic below. 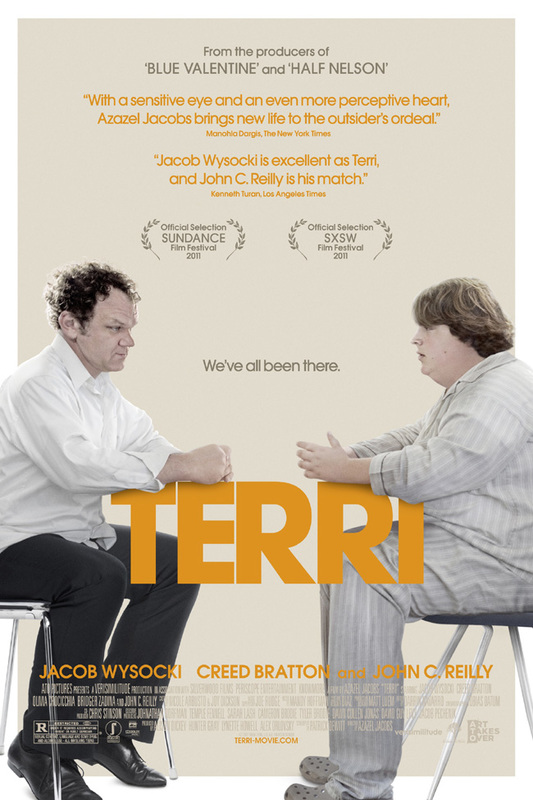 The movie poster for “Terri” starring John C. Reilly. A recent hit at the Sundance Film Festival, “Terri” – which is directed by Azazel Jacobs (“Momma’s Man”) and produced by the team behind “Blue Valentine” and “Half Nelson” – is a moving and often funny film about the relationship between Terri (Jacob Wysocki) (an oversized teen misfit) and the garrulous but well-meaning vice principal (John C. Reilly) who reaches out to him. Having been abandoned by his parents to an ailing uncle (Creed Bratton of “The Office”), Terri is mercilessly teased by his peers and garners even more unwanted attention from school authorities by coming to school still wearing pajamas (when he decides to show up at all). Resigned to his outsider status, Terri is surprised when his tough-talking vice principal, Mr. Fitzgerald, takes an interest in him. Though his efforts are sometimes clumsy and occasionally dubiously professional, he genuinely wants to help him through this tough time. Under Fitzgerald’s tutelage, Terri befriends a pair of fellow misfits: Chad (Bridger Zadina) (an edgy loner whose rebellion masks his own insecurities) and Heather (Olivia Crocicchia) (a sexually precocious girl whose beauty proves to be a trap of its own). The three teenagers – so different on the surface but all outcasts in the unforgiving high school hierarchy – find an unexpected and imperfect bond that reflects the tenuousness, poignance and pathos of the adolescent experience. Deftly combining authentic and candid elements with wry humor and compassion, Jacobs tells Terri’s story with delicacy and complex emotionality as the young man learns to reach outside his insular world. A film about the courage it takes to build relationships and the rewards of taking that sometimes terrifying leap, “Terri” is for anyone who ever felt alone or misunderstood in high school. In other words, it’s for all of us. “Terri” stars John C. Reilly (“Cyrus,” “Chicago”), Jacob Wysocki (“Huge”), Creed Bratton (“The Office”), Olivia Crocicchia (“Rescue Me”) and Bridger Zadina (“Law and Order: Special Victims Unit”). The film is directed by Azazel Jacobs (“Momma’s Man”) from a screenplay by Patrick Dewitt. The producers are Alison Dickey (“Piggie”), Hunter Gray (“Half Nelson”), Lynette Howell (“Blue Valentine”) and Alex Orlovsky (“Blue Valentine”). The director of photography is Tobias Datum (“Momma’s Man”). The editor is Darrin Navarro (“Bug”). The production designer is Matthew Luem (“Soldiers Under Command”). The associate producers are Christine No (“The Eye”), Phaedon A. Papadopolous (“The Dinner Party”) and Crystal Powell (“Blue Valentine”). The co-producer is Chris Stinson (“Don McKay”). The executive producers are Cameron Brodie, Tyler Brodie, Dawn Cullen Jonas, David Guy Levy, Jacob Pechenik, Johnathan Dorfman, Temple Fennell and Sarah Lash. The movie trailer for “Terri” can be watched now below. How were you misunderstood in high school? Like all Hookups here, this Hookup is simple: Just submit your comment below and we will award 50 admit-two tickets randomly via e-mail for our “Terri” Hookup. Winners need to arrive early as seats are consumed on a first-come, first-served basis. Winners are typically e-mailed our advance-screening passes two days before the screening date. Good luck! Submitted by Trojan213 on July 6, 2011 - 5:12pm. I transferred High Schools and did not really talk to anyone. Most people saw me as a shy person but I’m really someone outgoing who likes to talk and meet new people. It was my senior year so I made small effort to change people’s opinions since I was out in less than a year. HOW WERE YOU MISUNDERSTOOD IN HS. Submitted by Anonymous (not verified) on July 6, 2011 - 5:12pm. I cant say i was miss understood in Highschool. But i do recall a time when the girls i hung out with in school looked at me differently then the girls i hung out with outside of school.. I was mature for my age and which at the time the girls may have looked at that as weird or different… being the eldest of 3 siblings and living with aunts and uncles that were older then me I grew up and understood alot of things that the younger crowd didnt.. which made me stand out jst a lil… Well i can say that being mature at a younger age helped me become the women i am 2day and it helped me stop some B.S. before it was thrown at me.. Submitted by Hendrix on July 6, 2011 - 5:15pm. To be honest, I was barely noticed by most ! Submitted by Anonymous (not verified) on July 6, 2011 - 5:15pm. Submitted by Anonymous (not verified) on July 6, 2011 - 5:18pm. Most people didn’t really get to know me at all. I was fairly quiet. Submitted by FreeM0vie on July 6, 2011 - 5:18pm. Submitted by ed on July 6, 2011 - 5:21pm. Submitted by erika on July 6, 2011 - 5:24pm. Submitted by samuel hernandez (not verified) on July 6, 2011 - 5:25pm. Submitted by fly navy on July 6, 2011 - 5:32pm.